I can see clearly now. The rain is gone. It’s gonna be a bright, bright sunshiny day! Now that you have that classic Johnny Nash song stuck in your head I made a lunch about it! From the top left are black seedless grapes and watermelon suns. 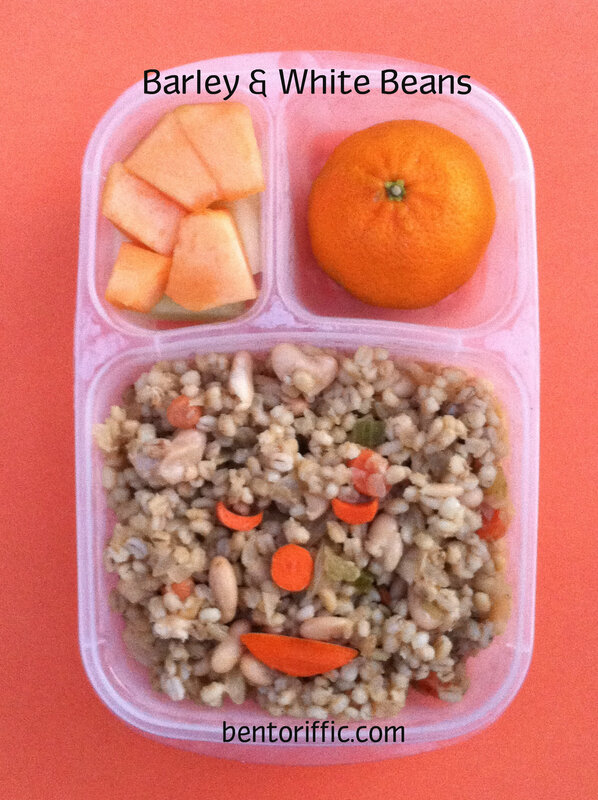 At the top right is barley, white beans and carrot pennies from dinner the night before. In the bottom compartment is a smiley sunshine sandwich on Rudi’s Honey Wheat bread. Above the sun are pineapple pieces with a honeydew bird. To the right are honeydew pieces with a cantaloupe sun and the bottom right pink cup are cantaloupe pieces with a honeydew palm tree and some fun face picks for decoration. Her lunch is packed in Easy LunchBoxes container. 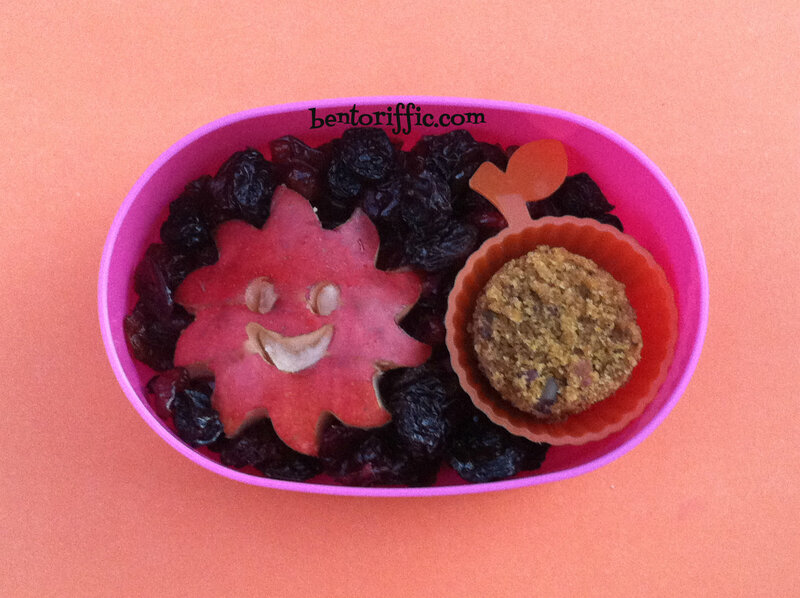 For her snack, my 4 year old has a matching smiling sun d’anjou pear surrounded by dried cranberries and raisins. In the orange blossom cup are carrot bread circles. Little Miss 2 year old has a veterinarian visiting her class today so I made her a dog. We actually have a long haired dachshund so this looks a lot like him, without the raisin eye and nose, of course. I used the leftover crust for his ear. She also has carrot bread circles in the tiny green bucket above the dog. In the Stitch container is trail mix of mixed nuts, dried fruits and seeds. 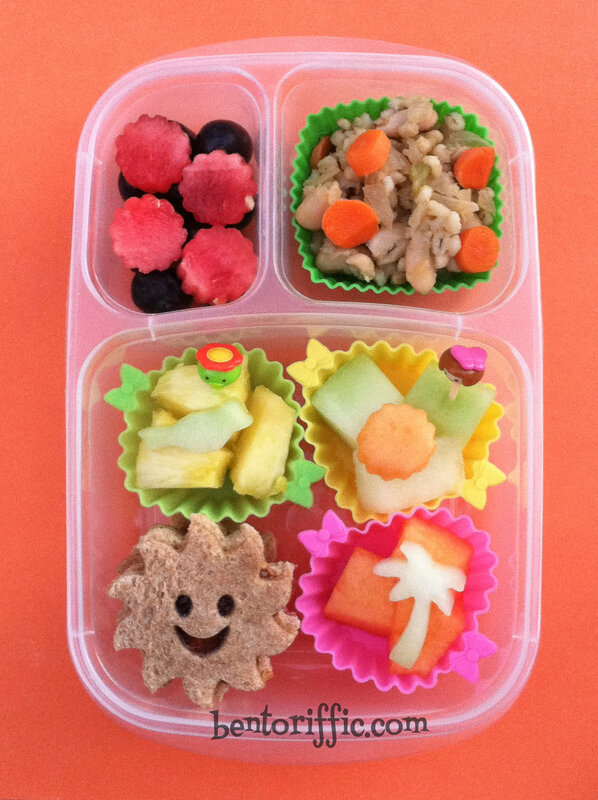 At the top left are pineapple pieces with a watermelon sun and the top right are black seedless grapes packed in her LunchBots Uno stainless container. And packed in his Easy LunchBoxes container are leftovers for my husband. The last night we had barley with white beans, carrots, onions and a bit of celery seasoned with cinnamon and oranges from one of my new plant based cookbooks. Yum! I made a smiley face with the carrots. At the top left are honeydew and cantaloupe pieces and at the top right, a clementine. If I haven’t raved about them enough, The LunchPunch makes some of the greatest sandwich cutters out there. 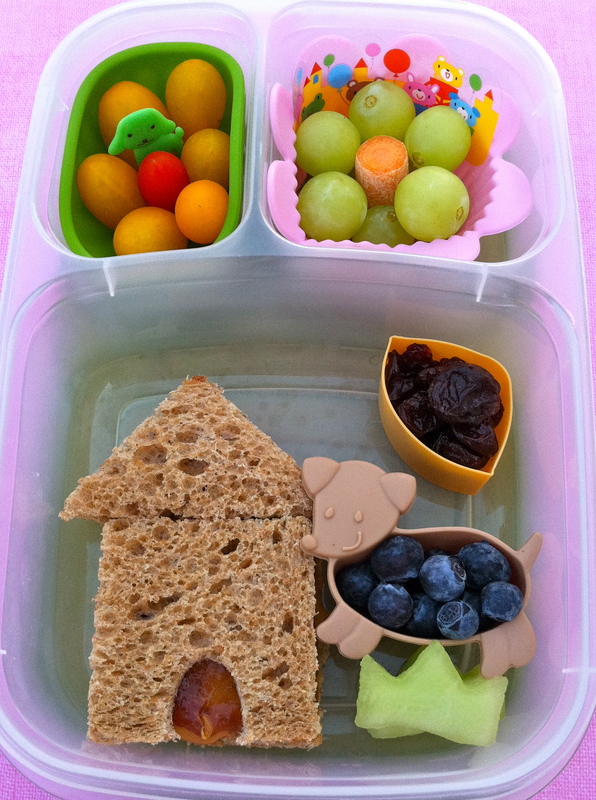 They are cute, they waste little bread, they’re sturdy and they save SO much time with lunches! This one is Rudi’s Nut and Oat bread with a pumpernickel dog piece in the middle. I used bread crust for his collar and the flowers cutouts are from the apple at the top left and a tree trunk pick. On the dog picks on either side are green seedless grapes. The top left is an apple tree with flower cutouts and more green grapes underneath. At the top right are watermelon fire hydrants because we all know dogs are drawn to them! 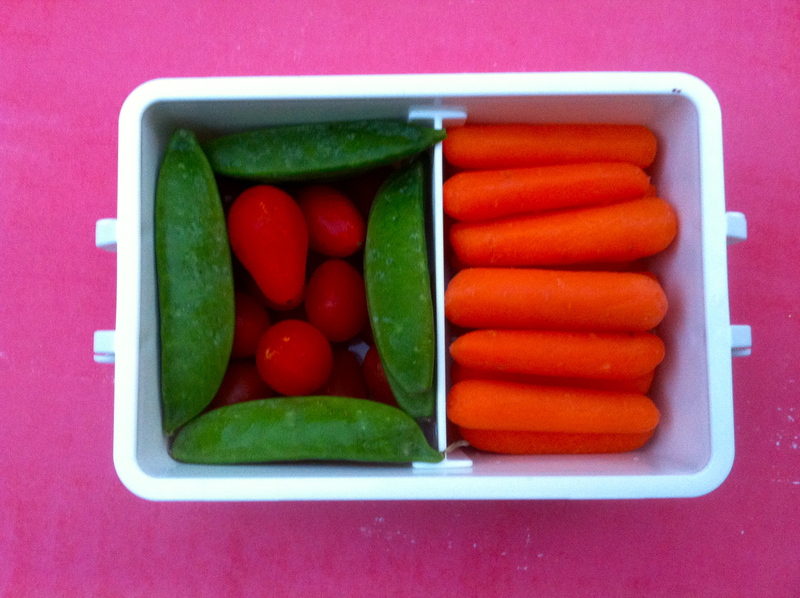 Miss G’s snack today is sugar snap peas, grape tomatoes and mini carrots. And Little Miss A is doing the letter C this week so the topic of the week was the circus. From the bottom left is a round clown face sandwich. The eyes are vegan chocolate chips, the nose is a dried apricot, the cheeks are raspberries, the mouth is Stretch Island fruit leather and the hair is Shirataki brand tofu pasta. The hat above is watermelon and cantaloupe triangles surrounded by green grapes. 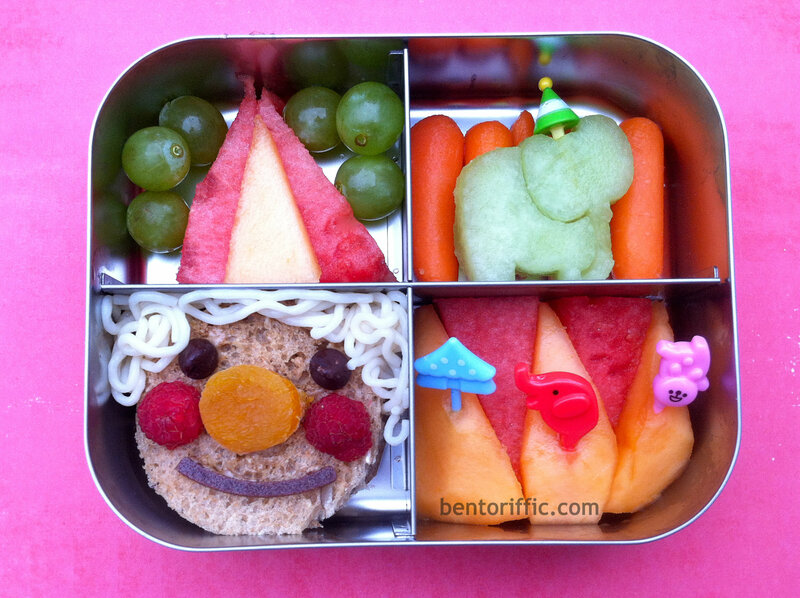 At the top right are mini carrots and a honeydew melon elephant with a pick hat. He’s standing on a circus stand below made of watermelon and cantaloupe with circus themed picks of the big top, another elephant and a seal in her LunchBots Quad. My husband has to travel today so I suggested that I pack him a lunch. Airport food is dreadful in general, but when I flew recently I realized how tough it is to find ANYTHING vegitarian, vegan or just plain healthy. I packed my own sandwiches, but it was a long day of traveling. We are still doing our plant based diet so the goal is to eat as little processed food as possible. Since we’re still a bit new to the diet it takes some planning ahead. He may want to kill me for a cutesy sandwich, but I couldn’t resist. He has the airplane LunchPunch cut out of Rudi’s Whole Grain bread which is our favorite brand for the past few months. 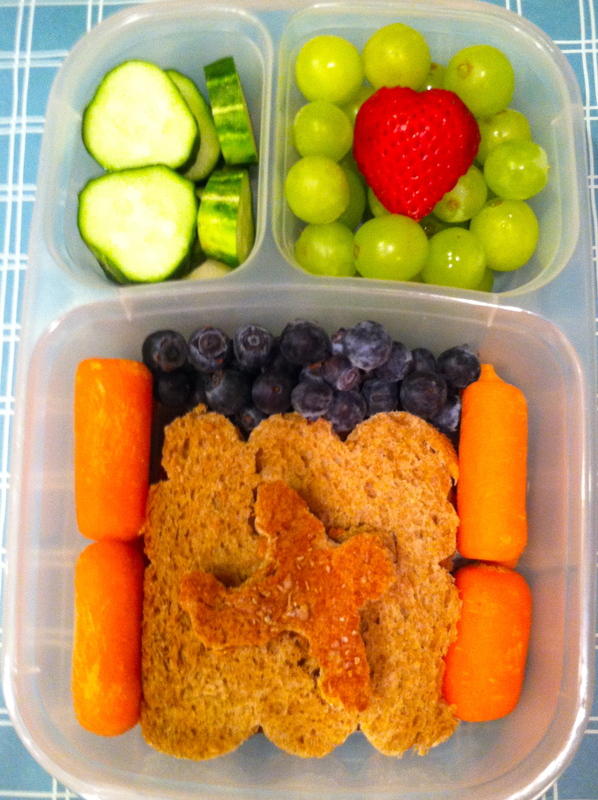 The sandwich is surrounded by organic mini carrots and fresh blueberries on the top part. 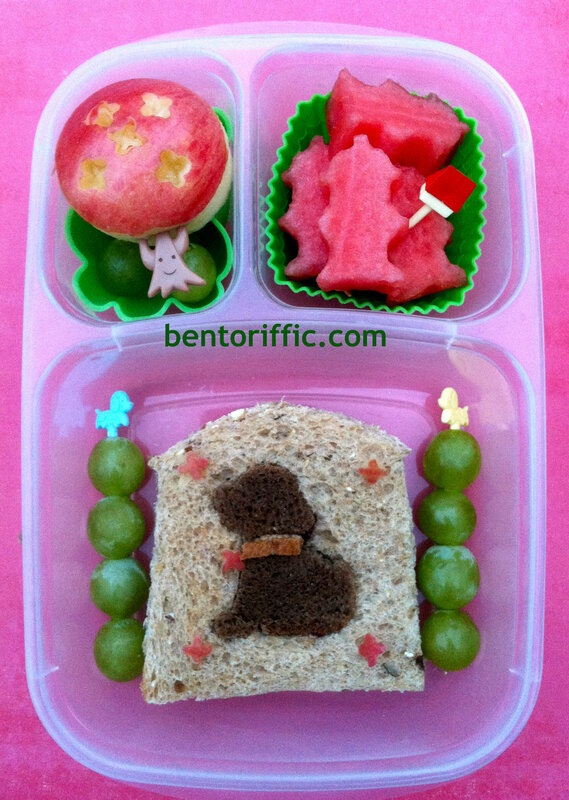 At the top left are locally grown cucumber slices and at the top right are grapes and a strawberry heart packed in his Easy Lunch Box. Please excuse the poor photos for his traveling lunch. I had to take them late last night. Since I know he will be traveling most of the day, I also packed a second smaller bento box. The bottom part has a single serve Sabra brand hummus with whole grain crackers and a heart container with dried cherries in it. 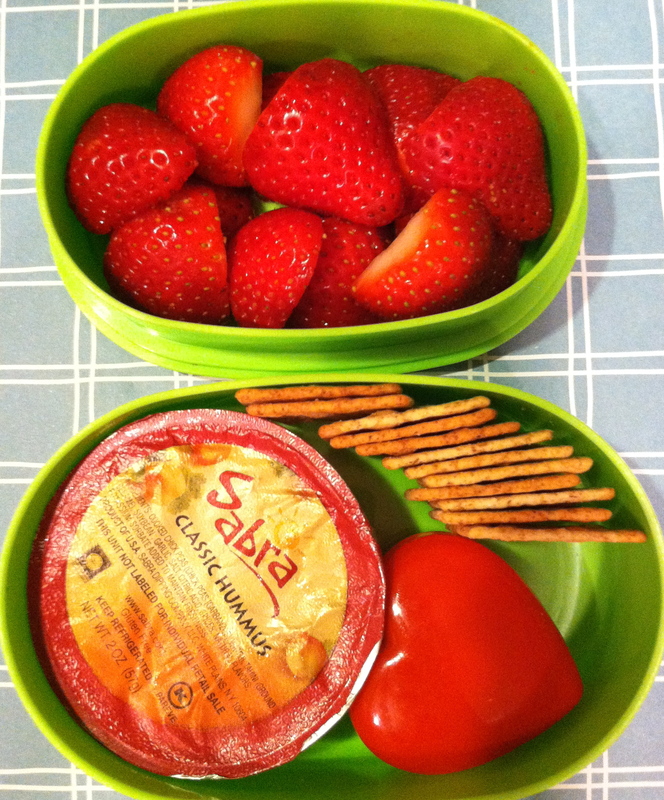 The top portion is packed with halved strawberries as his afternoon snack along with a couple of Larabars. Little Miss 2 year old is having an apple sandwich on Rudi’s Whole Grain bread with a surprise “worm” coming out of it. It’s actually an Annie’s Organic Fruit Bunny, but I drew a small face on one end with a food marker. Looks like a worm to me! She’s also having a small apple container of dried cherries. 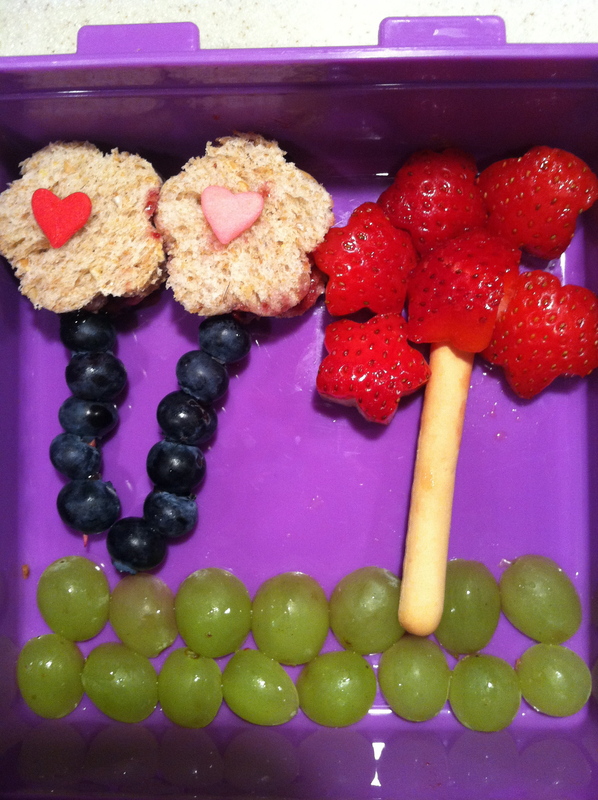 On the left side of her LunchBots Duo is a flower cup of halved grapes and a strawberry heart on top. Above that are blueberries. Miss G is having a dog house sandwich with a silicone dog cup of blueberries, honeydew melon grass and a small orange cup of dried cherries. At the top right are grapes surrounding a carrot stick. 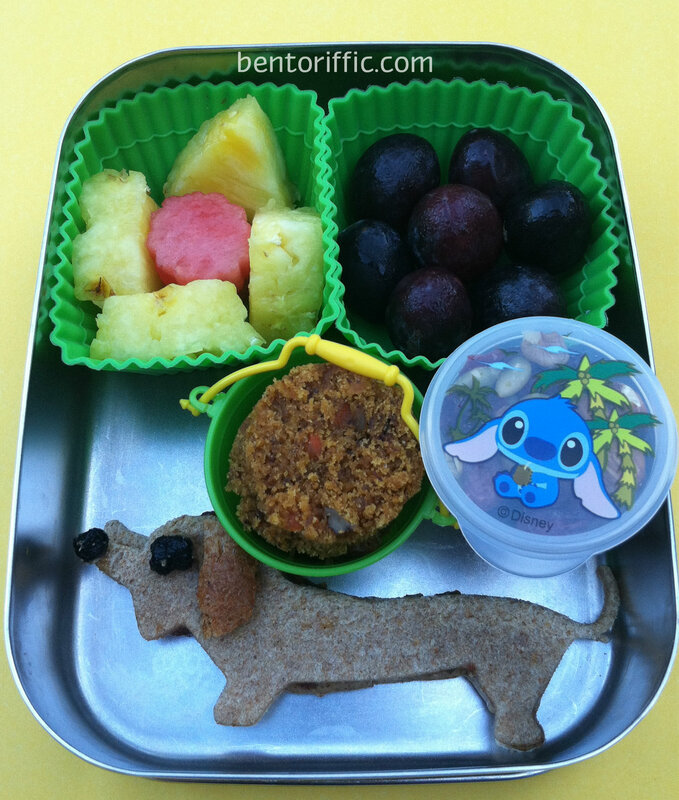 At the top left is a cup of homegrown heirloom tomatoes and a green dog pick packed in her Easy Lunch Box. 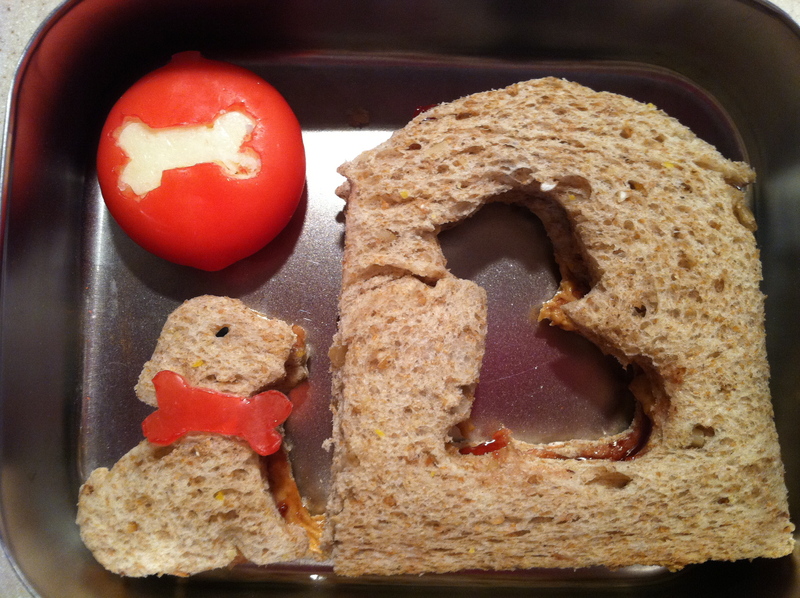 Miss G requested the dog in the doghouse for her sandwich today. This is another cutter made by LunchPunch. I purchased mine on Amazon. Today it’s just a PB & J on whole grain bread. The red thing is a Babybel cheese with a small bone cut out of it. I used the wax bow for the puppy collar and a black sesame seed for the puppy’s eye. 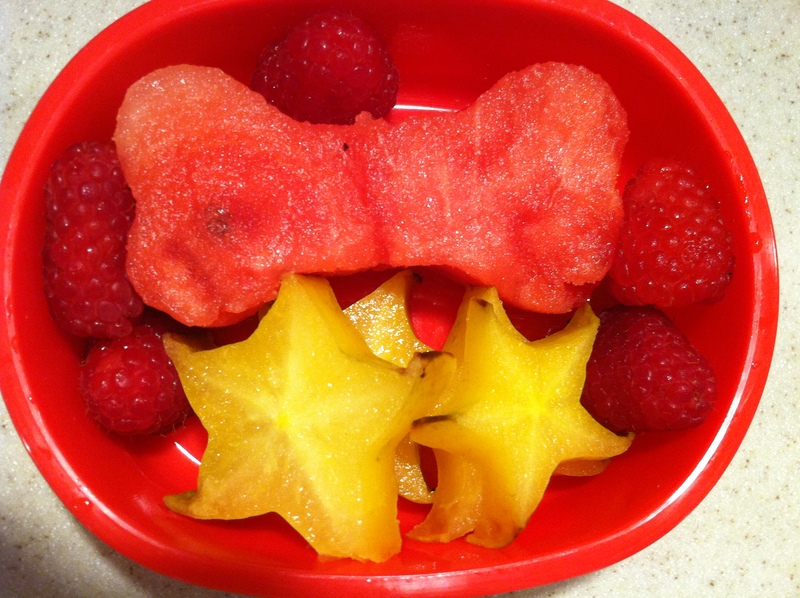 To go along with Miss G’s sandwich, I gave her a giant piece of watermelon shaped like a bone, raspberries and star fruit or carambola which she loves. Little A got a mixture of leftovers for her entree today. On the left side buried is spaghetti squash with grated parmesan and cheese pizza and meatballs shaped like flowers on top. On the right side is the fruit. She got dates underneath her slice of starfruit. She doesn’t like the starfruit, but the experts say it takes an average of 19 times of a child trying something new before they will acquire a taste for it so the starfruit is my A for effort. 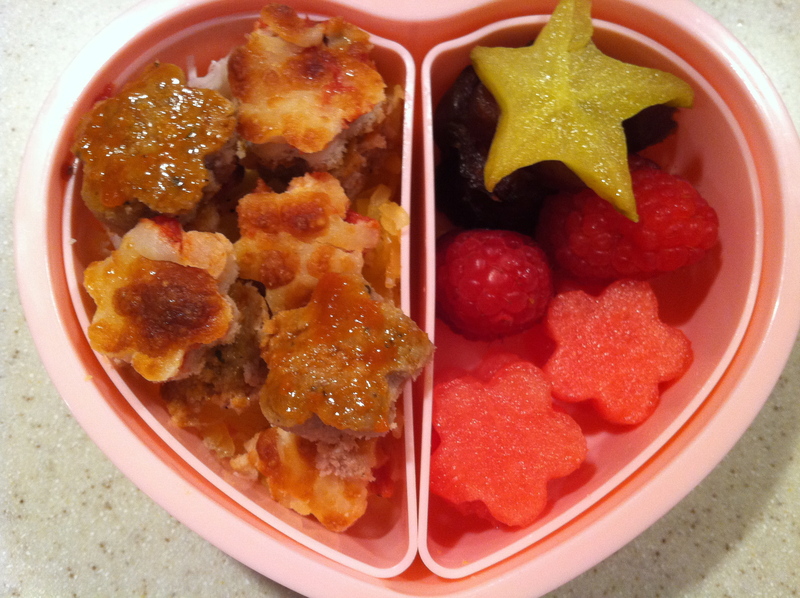 She also has a couple of raspberries and flower shaped watermelon pieces. 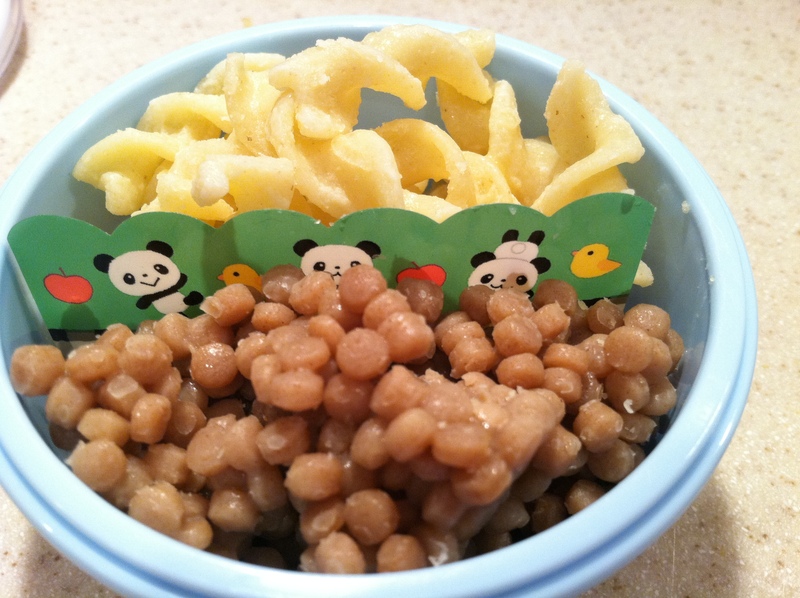 Lastly, Miss A got more Annie’s leftover macaroni spirals which she loves and whole wheat cous cous with a fun panda food separator. I’m out of kefir so both kids got a frozen squeezable yogurt tube today in their lunches. Happy Friday everyone! My little A didn’t finish her Mr. Potatohead yesterday with all the excitement going on at school so I scaled back a bit today. 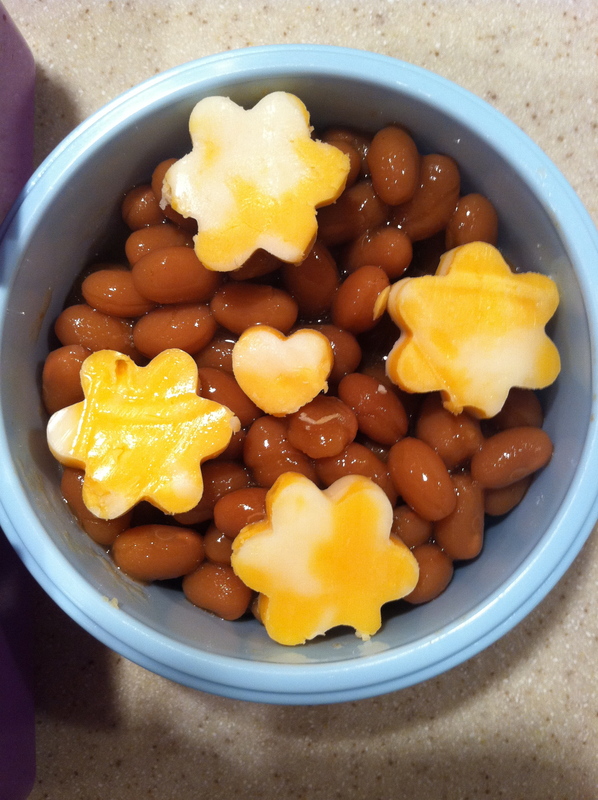 She loves baked beans so I included the leftovers from dinner with some pieces of colby jack on top for fun. 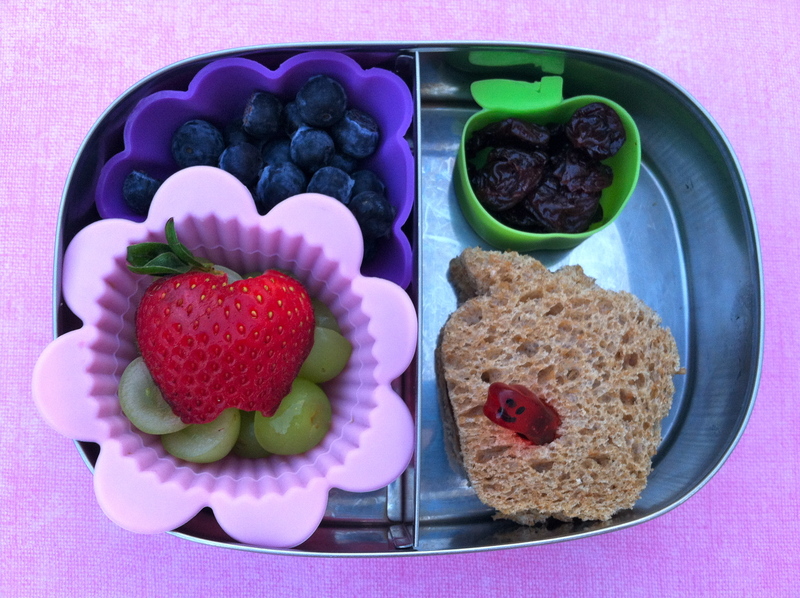 I also decided on some small flower sandwiches in the hopes that she’d finish her lunch today. They are just small PB & Js on whole grain bread with heart candies in the middle. The stems are blueberries on toothpicks. Next to those is a bouquet of strawberries cut into flowers and the stem is a vanilla biscuit. Under it all for the “grass” are organic green grapes sliced in half. 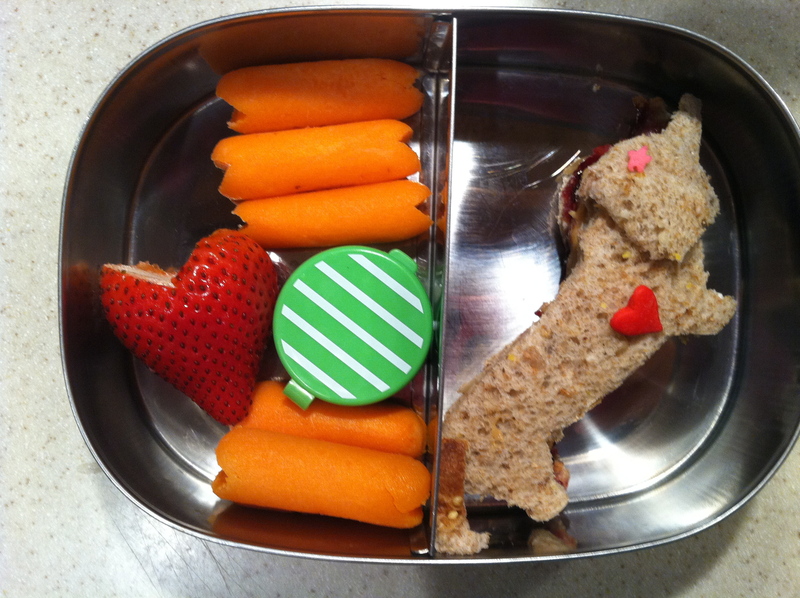 Miss G got a dachshund sandwich and some carrots with ranch dip and a strawberry heart. In a separate container (unshown) are seedless green grapes & blueberries. Both kids got lime Lifeway Kefir pouches today and ice water.